Please find Preliminary Program for your review and use. The Highlights include Senator Vivienne Poy for the Opening Ceremony, and Dr. Shiu Loon Kong, Keynote Address. This will be followed by our History Channel Tulou video with myself and YongDing County Officials, followed by a presentation by colleague XiaoYan Li on Hakka in China and Taiwan. XiaoYan is one of the most informative Hakka people on the planet and has been to many many Hakka Villages, both known and forgotten. This is the main conference poster with official title, dates, location and an overview of the preliminary program. We will be speaking in section 1. Please let your friends know. 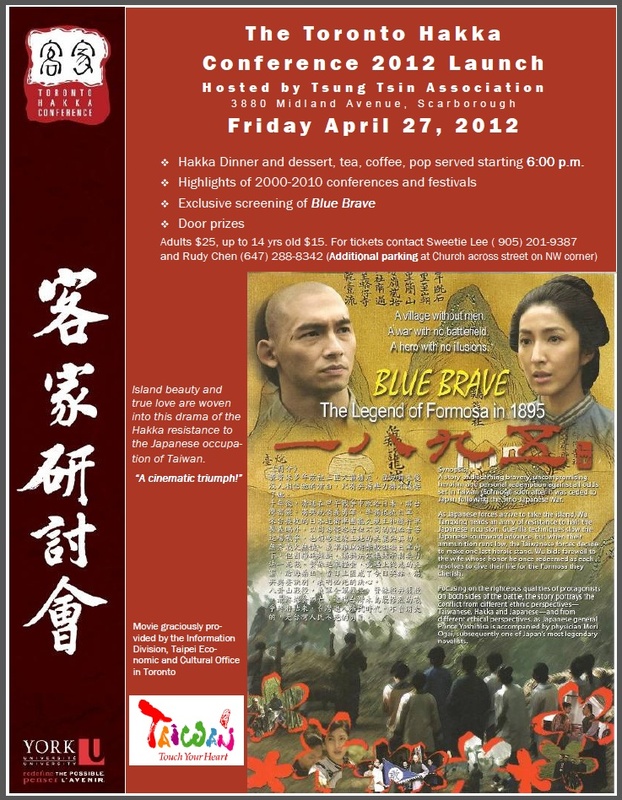 Above is a brand new poster advertising the Toronto Hakka Conference 2012. Neat graphics Keith et al. Thank you for managing to get Senator Vivienne Poy again to the Opening Ceremony, and Prof. Emeritus Dr. Shu Kong as keynote speaker. I will be posting these pages on my FaceBook page as well, http://www.facebook.com/profile.php?id=100002271443639&sk=wall in case you would like to be a friend. If you like my posting, please indicate so. The Hakka people are a large group of Chinese people who fled in groups from central to southern China over hundreds of years. 46 of their fortified rammed earth all-in-one mini-cities, castles, mansions and villages, each 2 to 5.5 stories high with their central courtyards, are now designated a Unesco World Heritage Site. History Channel's educational video on these architectural marvels ("Tulous"), with Minoru and myself, will be featured on the first day of the conference. Minoru Ueda, Keith Lowe, XiaoYan Li and I, will be giving talks based on our visits, studies and ecotours in southern China, since 2007. Our firm ASH Inc. was hired as consultant to History Channel USA to produce this video. It will be featured on opening day. Marc Pichard of the Ottawa Hakka Association has also made a link to the conference at: http://www.maleko.org/hakka_home.html. Thank you Marc. If you know of any company, group, association or government agency who would like to be a sponsor to help defray costs, please let Keith know. Thank you Keith for all your arduous work and continued perseverance, personal sacrifices and long commitment. Thanks also for the entire Toronto team for putting this entire event together. Hakka friends have informed me that there will be a free Hakka Music Concert in Meizhou on August 25 (1). "The purpose of this Concert is to help musicians to "Communicate & Collaborate" from Meizhou and Taiwan." Some of my friends are going. Maybe some of the musicians will remember and pay tribute to the rich tradition and unique village architecture in their music and lyrics, to celebrate the achievements of the Hakka culture as found in tulous of Fujian (2), weilong of Guangdong (3), weiwu of Jiangxi (4), and in Taiwan (5)? I hope that Hakka culture, and in particular their traditional and popular music, elegant pageantry, organic gardening, healthy food and well known festivals will regenerate and revitalize the most unique surviving Hakka villages for Global villagers of the 21st century, as the UNESCO World Heritage Sites are expanded into a Hakka BioSphere & Trail in southern China. 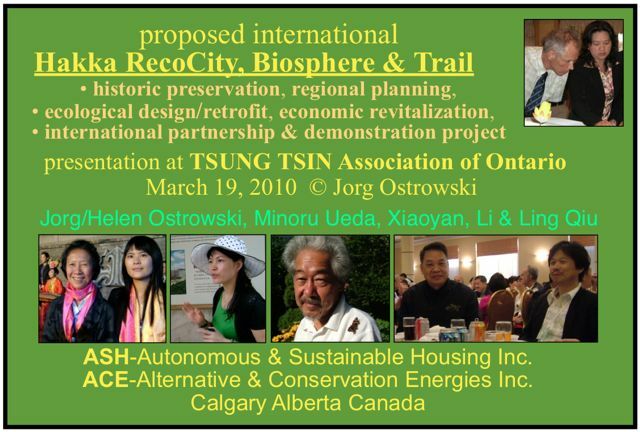 My Toronto PPT presentation entitled: Hakka RecoCity, BioSphere & Trail is now available available for viewing at: toronto_hh.pdf. The cover slide is shown above. Note: limited seating available. Please contact author if interested. The first public viewing in western US, of History Channel's new series, History Made for Tomorrow, featuring the historical Hakka tulous of southern China and our plans for an International Hakka RecoCity, BioSphere & Trail, will be held on Tuesday April 26, 6:30 PM to 8:30 PM in Gould Hall Room 435, University of Washington, Seattle. We will also show photos of a highly unusual and almost forgotten and abandoned Hakka palace that was rediscovered 2 years ago. In July 2008, 46 Hakka tulous (earth buildings) in Fujian province China, were designated as UNESCO World Heritage Sites. 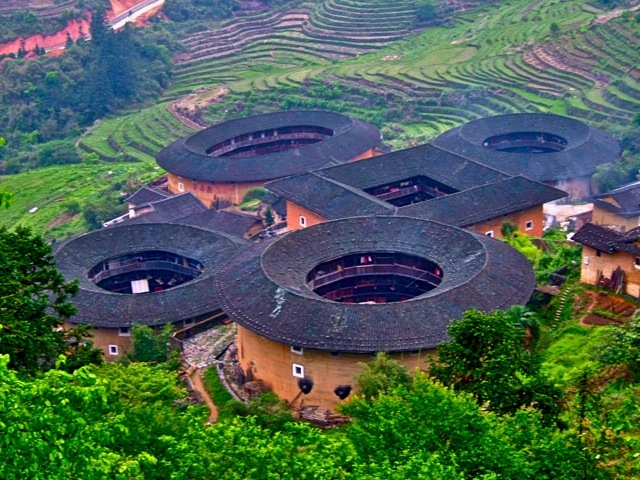 Although round tulous are the most famous, we have also visited/studied oval, square, rectangular, pentagonal and octagonal tulous, built ~ 769-1962, housing ~ 80-800 people, usually of the same clan, together with their culture, history, ancestors, relics, barns, animals, cottage industry, school, and the ever present courtyard for community events. Our BioSphere Plan is designed to preserve, upgrade, repopulate and link historic Hakka tulous and weilongs with local natural features that also need to be preserved, along an multi-purpose trail in west Fujian, south Jiangxi and east Guangdong provinces, combining ideas borrowed from the urban design plans of the Toronto Waterfront in 1972-1973 (now called Harbourfront) and lessons from our research, writing and presentations in Canada and China, on village architecture of the Hakka people. For more information, please go to Eco Postcards, videos, PPT and proposals at this site. • all discussion will focus on sustainable plans for Hakka tulou demonstration projects. Anyone interested in Hakka architecture, planning, construction, ecological retrofits, conserver lifestyle, or one of the largest UNESCO World Heritage Sites in China, is welcomed. Note: Limited seating available. First come, first served.